Dr. Karen Becerra helps a senior dental patient at the Gary and Mary West Senior Dental Center. As the CEO of the nonprofit Gary and Mary West Senior Dental Center, my team and I restore the smiles of some of the most vulnerable San Diego seniors. We opened our doors two years ago and have welcomed hundreds of patients into our 1,400-square-foot center, facilitating more than 7,800 visits. Many believe that dental work is purely cosmetic. It isn’t. What we do is transformative because we restore access to the most basic human functions — eating and speaking. We restore the dignity and self-confidence that has eluded San Diego seniors for too long. Dental care seems to be routine for many, but it tends to decrease as people age. With 10,000 Americans turning 65 every day, seniors are the fastest growing, high-need population in healthcare, and the problem is even more acute with dental care. Dental health is a known gateway to systemic wellness; however it is overlooked and under-covered. The American Dental Association’s Health Policy Institute says two-thirds of low-income seniors did not visit a dentist in the last year. Seniors primarily live on less than $850 a month and often have to choose between paying for basic necessities like rent, food or healthcare, making dental care a lower priority. Other barriers to treatment include lack of transportation, not feeling pain, or even believing it is no longer necessary to visit the dentist as we age. Poor dental health among seniors is a silent epidemic. If you do not address oral health, poor habits or lack of treatment can lead to serious health issues, not only in your mouth but elsewhere in the body. Research shows links between periodontal infections and chronic conditions like diabetes, cardiovascular disease, and respiratory disease, which can be especially devastating to older adults. By focusing exclusively on seniors, we ensure this rapidly growing demographic receives the care they need. Seniors like Annie, a downtown San Diego resident who is 65 years young. She has a job in customer service but doesn’t have dental coverage, and has dealt with multiple missing teeth and infected areas in her mouth for years. Embarrassed to speak or smile, she would talk to people with her hand over her mouth. Not having dental coverage made seeing a dentist cost prohibitive and forced her to medicate her dental pain rather than solving it. We performed extractions, and fabricated full upper and lower dentures. Annie now has a restored smile, beautiful and bright that lights up a room. She also regained her confidence to communicate with the public, which is an everyday task at work she would usually shy away from. Without access, more and more older Americans will seek treatment in hospital emergency rooms rather than in dental offices or clinics. Improvements in access, affordability, education, and awareness need to occur, or oral disease and health related issues will increase and become a costly public health issue for our aging population. There are several ways we can help older adults improve their dental health. Private practices should increase access by accepting more Denti-Cal patients and adapt consultations for older adults so they understand treatment options. Caregivers can evaluate the dental tools at home to ensure they are in proper shape. These can be adapted for use as needed for older adults who may have arthritis or other strength and mobility issues. Evaluate prescribed medications and if any cause dry mouth, make sure your oral routine and periodic dental visits accounts for this. 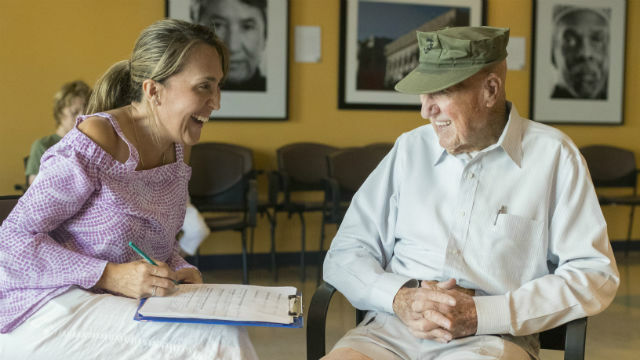 Together, we can continue to create thousands of smiles, and even save the lives, of low-income seniors in San Diego County. Karen Becerra, DDS, MPH, is the CEO and Dental Director of the Gary and Mary West Senior Dental Center. She brings two decades of clinical research and expertise as a practicing dentist to help establish the Gary and Mary West Senior Dental Center. To learn more or to make a donation, visit www.seniordentalcenter.org.